​KIDS CAN BE RADICAL FOR GOD, IF GIVEN THE OPPORTUNITY. DON'T LET SATAN STEAL YOUR GODLY SEED. SATAN IS A KIDNAPPER. ​THE HOLY SPIRIT TURNS WIMPS INTO WARRIORS. CHICKENS INTO CHAMPIONS. DORKS INTO DRAGON SLAYERS AND MAKES ORDINARY KIDS EXTRAORDINARY. Are you tired of just being a spectator in church rather than a participator? Would you like to be encouraged and equipped to be used by God in and out of the church meetings? Do you understand that the five fold ministry gifts of Apostle, Prophet, Evangelist, Pastor and Teacher, depicted in Eph 4: 11-12 were given by God to enable you and your children to live and walk in the supernatural; to fulfill His purposes in you and your children’s life; and to become an asset and blessing to the Body of Christ? Are you tired of seeing your children and youth being bored with church? Are you tired of seeing your children being babysat and entertained in children’s church? Is there more for the younger ones than a few Bible stories, Veggie Tales, puppets, clowns and crafts? Is there more for your teenagers than activities, sports, pizza parties, theme parks, Christian rock concerts and just hanging out with their friends? Would you like to see them knowing each other by the spirit rather than by the flesh? Would you like to see your children be included in the intercessory, worship, and prophetic teams? Do you desire to see anointed children and youth? Do you desire to see anointed children’s workers, Sunday school teachers and youth pastors? Would you like to have anointed nursery workers that know how to impart the presence of the Holy Spirit to the infants and toddlers? Would you like to see the parents take more responsibility for training their children to become godly, anointed, and have a sense of destiny and not just depend on the children’s workers and pastors? Would you like to see the leadership have a real vision to equip the saints, including the youngsters and know how to bring that about? These meetings often result in instant healing from blind eyes, deaf ears and other diseases, including back, neck and joint pain. Words of knowledge, prophesy, salvation and the baptism of the Holy Spirit also are often given through the ministry of the adults, youth and children. I just wanted to say thank you for coming to Kids Camp 2016. Your message was well received by the children. There was a break through that Riley and I have yearned for the children for years. Your gift of helping to usher in the Holy Spirit was so encouraging. Many of the children received the Baptism of the Holy Spirit with the evidence of speaking in tongues. Several of them have share their visions. One child shared 10 pages of what she saw in heaven. Please continue serving the Lord with your teachings and writings. We were truly blessed. During the family conference on the first night, there was such a weight anointing resting in the sanctuary. When Apostle David Walters began to minister it felt like a shake from an earthquake was under my feet. Then he ministered to me and imparted a blessing to take the children to another level. Another blessing was manifested when a prayer request was answered. My desire was to see the children minister to the body of Christ, and it came to pass when he activated them to go forth supernaturally and impart the people. Thank you again Apostle David Walters. My experience at the children's conference was amazing and so touching. I was able to lay hands on people and pray for them and they were healed. I felt the Spirit of the Lord working. The anointing was so great I started to cry tears of joy and relief. I learned in the conference about God and the wonderful things He has done and continues to do. I spoke in tongues for the first time. I saw God heal a lot of people and do miracles. God took control of people around me. He filled the kids, teens and adults with the Holy Spirit. God was very, very pleased with his children. When Pastor David Walters prayed for me I fell. I don't know how but I just did. I went to sleep for a little while. When I was asleep I saw me and God flying in the air. Then we landed on a cloud and I saw my grandpa and we hugged each other and then we danced. Then God grabbed my hands and said that I could do amazing things; I just had to try. Then I woke up. God demonstrated the gift of healing through me. I experienced being filled with the Holy Spirit. I didn't realize it because I didn't really feel anything. I was praying for a lady. I wasn't expecting anything to happen but something did happen. I was praying for another lady. She had been having very sudden migraines. After I prayed she recovered. I learned God can use anyone. Something that changed my life during the conference was when the kids prayed for my back pain and a little while later after they prayed for me my back didn't hurt anymore. I received healing from my back pain at the conference. What I learned at the conference: Parents should not hit their children with their hands. Parents should only have to speak one time or the child will have to be disciplined. God used me to pray for Sabrina and she got healed. My testimony after the conference: I started to learn to pray more and go in the path of God, so that I would stop acting out of sin; that I would go in the right path; so He could help me with my problems that I have done before. I prayed for people and got the anointing of healing that God gave me. That day it came out of my heart and I got filled with the Holy Spirit. All the sick got healed in the Holy Spirit. When Pastor David Walters was praying for me and I fell, I heard God talk to me telling me I need to build up my spirit by reading my bible and praying more. Also he said I need to open up and stop being so shy. God told me I need to show who I really am. When I was praying for the adults, I felt the anointing and power of God all on me like when I was praying for this lady, I just started crying and prophesying to her and rebuking the plan of the enemy. The lady got healed. My experience at the family conference was an original. I never expected that Apostle David Walters would have the kids praying for the sick. The children were experiencing things they never experienced. Apostle David Walters laid hands on me: everything I was worrying about God said He will take care of it. So that put me at ease. Ever since the family conference I have a pure heart for God and I will continue. Thank you Apostle David Walters. During the family conference, Apostle David Walters asked for us to come up to get filled with the Holy Spirit. I came up and got filled. The next day we were asked to come and pray for people. I saw miracles happen. It was amazing. God is amazing! During the weekend, Apostle David Walters came to Ecclesia to speak the Word. During the service things changed: the Holy Spirit used us in different ways. The kids prayed for adults. Even though I was afraid, the Lord helped me open up a little at a time. It was a coincidence that at the time I was scared, Apostle David Walters was saying don't be scared to come up here to come get prayed for, don't care who's looking at you. As I listened closely I thought to myself and said next time I'm going to go up there with no fear. I will shake the devil off my shoulder. I know that's what God wants me to do. When Apostle David Walters visited Ecclesia I experienced the powerful move of God. He showed me that children can do the exact things that adults can do. I knew this, but I had never seen an example first hand. At times I do feel that Children's Church and Youth Programs are used as childcare. But now I believe we're going to make a change for the better. I think that Children's Church will become more and more respected. During the family conference Apostle David Walters had us praying for adults. Before that time I had a desire to pray for people, but I never had the courage to do that. As I started praying doubt started creeping in. But I just trusted God and people were healed. That was encouraging. On the day of the conference in which I was surrendering to Jesus, I felt a couple of things: I was shivering and feeling refreshed, and also had a more positive mindset change. My legs were numb and it was a little uncomfortable walking. During the miracle service, Apostle David Walters asked those with family issues to come up to be prayed for by the children. I went up and 7 year old Alyshia prayed for me. I let her know to pray for peace in my home. God was doing great things through Apostle David Walters in this conference, and the enemy was trying to distract me. Alyshia prayed for quite a while. When I got home that evening, peace met me. Family member #1 was at peace. The phone rang, and family member #2 was at peace. The doorbell rang, and family member #3 was at peace. For all three to be at peace was beyond my expectation, but peace in my home included all three and that's what Alyshia prayed for. I believe this increased my faith level in believing God to do a complete work. God used 7 year old Alyshia mightily. Since the conference, I have noticed an increased boldness on the children. 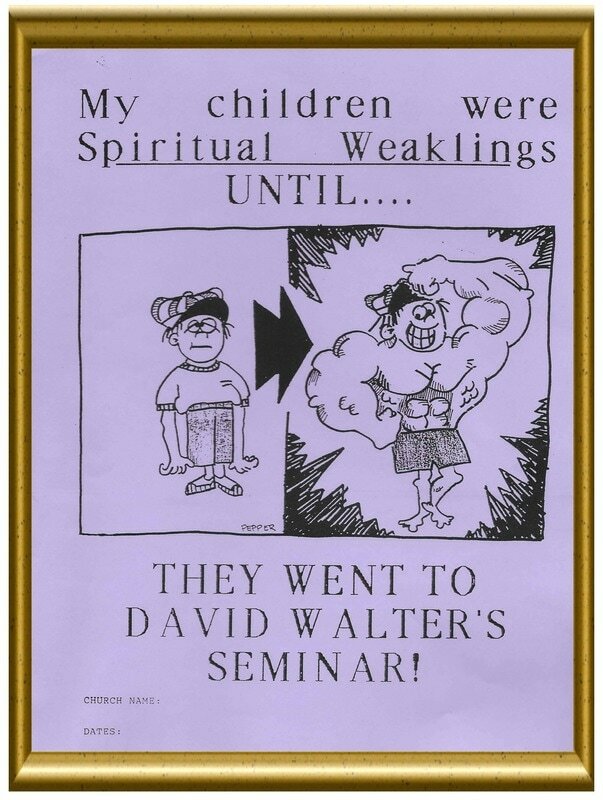 We are currently using Apostle David Walters' Children's Bible Studies to teach the children. We are committed to training and equipping the children to be used by God now. Also, this year's Vacation Bible School will be geared towards imparting rather than entertaining the children. Thank you God! Thank you Apostle David Walters. May God bless you and your ministry, and may God continue to open doors for you to minister this very important message to the body of Christ.